Hard Rock Cafe NEW YORK. STAFF EXCLUSIVE Lapel PIN Badge in Display Box! Grand Opening Party Guitar Pin from when the New York Cafe moved to Times Square, the Grand Opening Party was held September 17th. Velvet Revolver was the GO Party band. G Gold base metal pin (PIN USA) is. 2 1/4" tall x 1 3/8" wide. 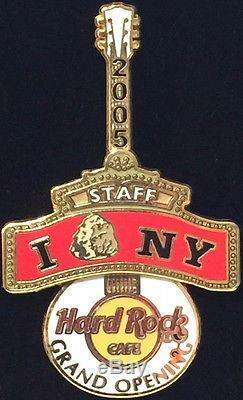 This COOL Pin is a great LIMITED addition to your HARD ROCKIN' Pin condition! 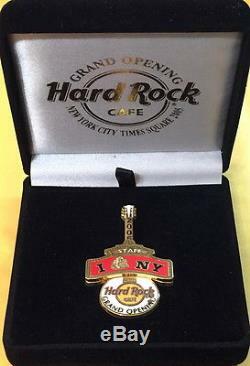 The item "Hard Rock Cafe NEW YORK 2005 GRAND OPENING Party STAFF Guitar PIN Box HRC #34702" is in sale since Sunday, May 21, 2017.